The Mu Sigma Phi Sorority is now accepting entries for the 2nd Gawad Panitikang Pangkalusugan - a Nationwide Children’s Storybook Writing Competition on HEALTH. 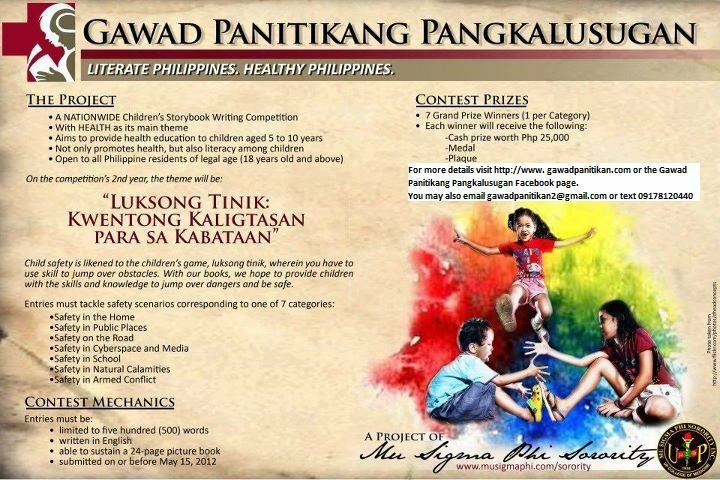 In its second year, the competition carries the theme: “Luksong Tinik: Kwentong Kaligtasan para sa Kabataan”. 1. The contest is open to all Philippine residents aged 18 and above with the exception of members of the Mu Sigma Phi Sorority and their first-degree relatives. 2. All entries must be original works written in English. 3. Entries should be easily read and understood by readers aged 5-10 years old. 4. Writers are free to use various literary forms (prose, poetry, etc.) and genres (i.e. comedy, horror, science fiction, fantasy). 5. Entries must be no more than 500 words and must be able to sustain a 24-page illustrated book. 7. A contestant may send more than one entry. 8. Entries must be double-spaced on 8 ½ x 11 inches bond paper, with one-inch margin on all sides, typewritten or computerized using black ink on white paper. The font should be font size 12 Arial or Times New Roman if computerized. 9. Entries shall consist of an original and six (6) copies, placed in an envelope, on the face of which only the pen name of the contestant should appear. A notarized certification from the author must be included, vouching for the originality of the entry and for the freedom of the organizers from any liability arising from the infringement of copyright in case of publication, and affirming that the entry or any variant thereof has a) never been published nor b) won any other contest i.e. that it has never won 1st place in any other contest or otherwise been awarded a medal, a citation, or included in a publicized list of meritorious entries to a literary contest. 10. Together with each entry, contestants must submit a second envelope, on the face of which the pen name shall appear. This must contain the personal data sheet, with the contestant’s full name, address, contact numbers, and a short literary background. All entries must be sent through snail mail to P.O. Box 608, Manila Central Post Office c/o Margaret Rose C. Bocaya, U1122 Malate Adriatico Grand Residences, Ermita, Manila. 11. All entries must be received by the Mu Sigma Phi Sorority from December 5, 2011 to no later than 5:00 p.m., May 15, 2012. 12. There will be one winner per category. The judges also reserve the right to declare that there are no winners in some or all categories. Each winner will receive P25,000.00 in cash, a gold medal, as well as an opportunity to be published. Winners will be announced no later than August 15, 2012. The decision of the judges will be final. Non-winning entries may be claimed from P.O. Box 608 until May 15, 2013 at U1122 Malate Adriatico Grand Residences, Ermita, Manila. 13. All unclaimed non-winning entries will be destroyed. 14. When the winning entries are published by the MSPS, it is understood that the MSPS is the sole exclusive publisher and claims ownership of the copyright. The prizes for the winning authors will serve as the only payment for the copyright.